Seth Rogen has lined up his next comedy project and it sounds like something only he could possibly pull off. 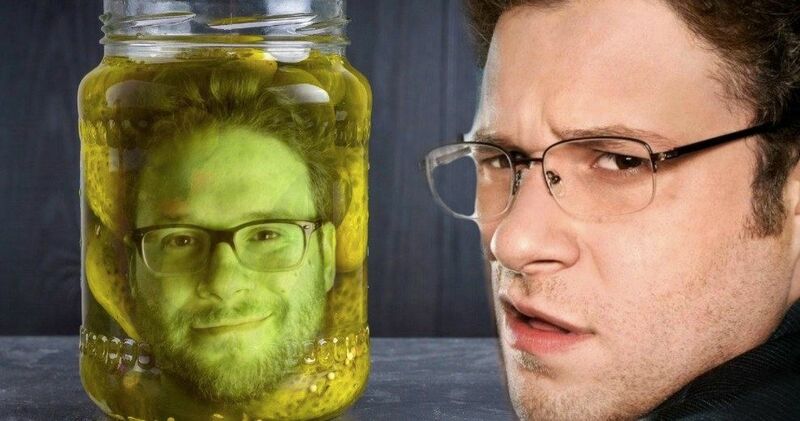 Rogen and his longtime producing partner Evan Goldberg are in negotiations with Sony to produce the Seth Rogen Pickle Movie, that will see Rogen play a man who is preserved in a pickle barrel for 100 years, only to emerge after a century in the middle of modern day, hipster Brooklyn, New York. Yes, really. The untitled is based on the novella Sell Out, published by The New Yorker in 2013. The story sees a young man by the name of Herschel Greenbaum, who works at a pickle factory in the early 1900s. One day he falls into a factory pickle barrel and, as stated previously, he reemerges 100 years later in Brooklyn. It’s a very bizarre play on the whole man out of time/fish out of water story. The real twist here is that Greenbaum learns his only surviving relative is his great grandson, a computer programmer named Ben, who will also reportedly be played by Seth Rogen. Are they going to bother explaining how a man was actually pickled and preserved yet remained alive for so long? Who knows at this point, but it’s the kind of thing that one can picture Seth Rogen handling quite well. Should the project move forward, it looks like Brandon Trost will be making his directorial debut. Trost served as director of photography on other projects that Seth Rogen was involved in such as This Is the End, Neighbors and last year’s Oscar-nominated The Disaster Artist. Trost also directed an episode of Hulu’s Future Man, which Rogen and Goldberg executive produce. This is far from the first time that Seth Rogen has paired with Sony. The filmmaker and the studio have a prosperous relationship dating back to 2007’s Superbad. They’ve also collaborated on movies such as Pineapple Express, The Night Before and the not-so-prosperous comic book adaptation, The Green Hornet. Their last collaboration came in 2016 with the R-rated, animated comedy Sausage Party, which went on to become a commercial success, grossing $140 million worldwide. In the couple of years since Sausage Party, Rogen has remained busy, with roles in the upcoming comedy Flarsky alongside Charlize Theron, as well as a voice role as Pumba in Disney’s live-action remake of The Lion King, amongst the many other projects he produces, such as this year’s hit comedy Blockers. Simon Rich, who wrote Sell Out, will pen the screenplay for the movie adaptation. Should everything go according to plan, production will begin in October, making for a pretty quick turnaround, considering we’re only just now learning of the project. The untitled comedy does not currently have a release date, but if the production timetable sticks, expect to see it bow in late 2019 or early 2020. This news was first reported by Variety.